BFHA teams tear it up at the (former) Southeast Tournament, held each Fall. 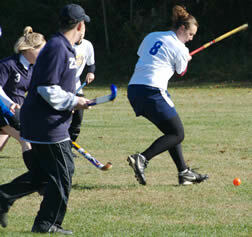 As part of its mission, the Baltimore Field Hockey Association (BFHA) strives to promote the growth of field hockey in the Baltimore region for youth and adult players, men and women. To realize this goal, BFHA sponsors youth/high school and adult field hockey leagues and tournaments throughout the year. Tournaments are a great chance to play on a more competitive level as well as play with old friends and make new friends. In addition to sponsoring tournaments, BFHA plays in a number of tournaments, often sending one or two teams comprised of BFHA members.